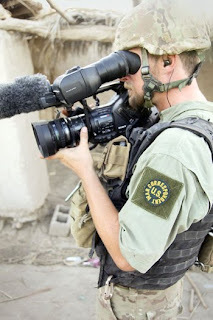 from russia today: The Wayne Madsen Report says that the CIA used Blackwater-linked mercenaries as journalists in order to gather intelligence. Allegedly, two people working as sub-contractors to the CIA had significant links to Blackwater's operations in Afghanistan, Pakistan, Iran, and Iraq. So who are these individuals, what kinds of links did they have to these operations, and how were these agencies able to get away with this? RT's Dina Gusovsky gets all the details from investigative journalist and RT contributor Wayne Madsen. 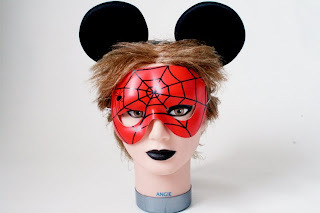 from ap: The Walt Disney Co. is buying Marvel Entertainment Inc. for $4 billion in cash and stock, bringing such characters as Iron Man and Spider-Man into the family of Mickey Mouse and WALL-E. Under the deal, which was announced Monday and is expected to close by the end of the year, Disney will acquire the rights to 5,000 Marvel characters. Many of them, including the Fantastic Four and the X-Men, were co-created by the comic book legend Stan Lee. Disney CEO Robert Iger said Marvel's comic books, TV shows, movies and video games amounted to "a treasure trove of content." Iger said the deal would bring benefits like the ones Disney got from buying "Toy Story" creator Pixar Animation Studios Inc. for $7.4 billion in stock in 2006. "The acquisition of Marvel offers us a similar opportunity to advance our strategy," Iger said, and "to build a business that is stronger than the sum of its parts." in a flu pandemic, what can the government do to you? 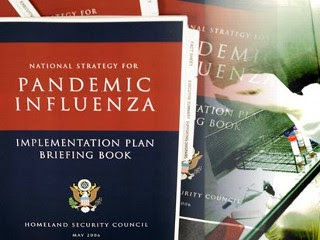 from abcnews: What might life be like during the kind of major swine flu pandemic predicted by the White House to hit the U.S. this fall? The worst-case scenarios percolate on the edges of thought: bans on public gatherings, restricting the movement of afflicted individuals, and compelled vaccinations. Conspiracy theorists go farther, suggesting that the World Health Organization is behind a secret plan to inoculate Americans at gunpoint with immune-system depleting vaccines to depopulate the globe. The CDC's report, released Monday, may well create some level of hysteria. It said 1.8 million Americans could become seriously ill this fall and as many as 90,000 could die... As to the fears about a WHO conspiracy, Nuzzo adds: "The WHO staff is smaller than the New York City Health Department, so its ability to impose worldwide martial law would be a miracle." from washington post: NBC's "Today" show has hired someone with White House experience as a new correspondent - former first daughter Jenna Hager. The daughter of former President George W. Bush will contribute stories about once a month on issues like education to television's top-rated morning news show, said Jim Bell, its executive producer. Hager, a 27-year-old teacher in Baltimore, said she has always wanted to be a teacher and a writer, and has already authored two books. But she was intrigued by the idea of getting into television when Bell contacted her. "It wasn't something I'd always dreamed to do," she said. "But I think one of the most important things in life is to be open-minded and to be open-minded for change." from corbett report: Conceived in iniquity and born in sin, the EU is the model dictatorship for the oligarchs and globalists who are seeking to centralize their power in large regional governments. The Irish David defeated the EU Goliath in their Lisbon Treaty referendum last year... but we all know the EU bureaucrats won't take no for an answer. Join us this week on The Corbett Report as we talk to professors and activists about how the free people of the world can stop the globalists in Europe. from corbett report: Bob Chapman of The International Forecaster joins us to discuss sound money and fiat money. We discuss the gold standard, why it was dropped by Nixon, and the current Federal Reserve fiat system. 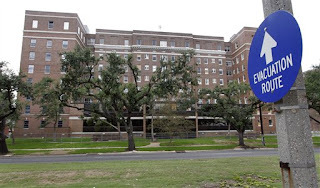 from raw story: A doctor who was working the rounds at New Orleans’ Memorial Medical Center during Hurricane Katrina has admitted euthanizing patients during a crucial shortage of energy and supplies at the hospital. Despite the revelations, the state prosecution service in Louisiana says it will not re-open an investigation into the matter, the Associated Press reports. The doctor’s admission comes on the fourth anniversary of Hurricane Katrina making landfall on the Gulf Coast, an event that would lead to the death of more than 1,000 people and the displacement of a city of one million. It also comes at a time when the US is busy debating fundamental reforms to the country’s health system. The specter of “rationed health care” has been raised during the debate. 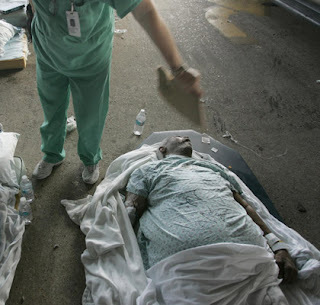 But in the panic and chaos of Katrina, the notion of “rationed care” was taken to a brutal new level. Dr. Ewing Cook told ProPublica’s Sheri Fink that he gave the order to give an elderly patient a dose of morphine he knew would kill her. ‘‘Do you mind just increasing the morphine and giving her enough until she goes?’’ Cook says he asked the patient’s nurse. In a sign of his certainty the patient would die under the morphine overdose, Cook penciled in “Pronounced dead at” on the patient’s chart and left it blank to be filled in later. The complete investigative article from ProPublica, which appears in the August 30 edition of the New York Times, follows below. from washington post: In what has become a sadly familiar ritual, about 100 students huddled together Friday on the Drillfield at the heart of the Virginia Tech campus, weeping and singing hymns as they mourned two slain classmates. Heidi Childs, 18, and David Metzler, 19, bright and promising students who were active in Campus Crusade for Christ, were found fatally shot Thursday morning in a national park about 15 miles from campus. Police said Friday that they had no suspects. 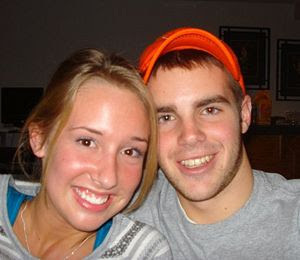 The deaths of the young couple, during the first week of classes, shook a community that has endured a string of tragedies. In April 2007, it became the site of the worst mass killing by an individual in U.S. history when a troubled student fatally shot 32 people and himself. In January, a student was decapitated in a campus cafe, and a classmate was charged. "It's more disbelief," said Olivia Kasik, 19, a sophomore from Woodbridge. "It happened again. You can't really wrap your head around it." from usatoday: Hurricane Katrina, which struck the Gulf Coast four years ago, was an eye-opener for all Americans. The inability of New Orleans to cope was shocking. 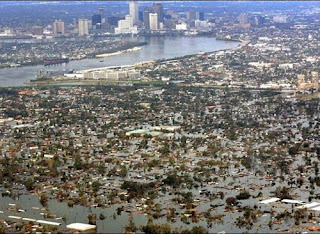 The levees built to protect the city were failures. The follies of the Federal Emergency Management Agency were maddening. Surely a tragedy of this scale (more than 1,600 deaths in Louisiana and Mississippi), a humiliation of this magnitude, would prompt officials to prepare better for the next major hurricane. With Tropical Storm Danny threatening the Northeast this weekend, and other storms potentially to come this hurricane season, it would be nice to believe that Katrina's lessons have been learned. from washington times: President Obama set out for a weeklong family vacation Sunday facing the first stiff headwind of his presidency, with public polls showing his popularity has dipped as he has attempted an overhaul of the nation's ailing health care system. A series of national surveys has confirmed what was becoming clear as large groups of protesters rallied outside the speeches and town-hall events the president hosted last week in Western states. The Rasmussen Reports daily tracking poll released Sunday showed that 41 percent of voters strongly disapprove of Mr. Obama's performance as president, compared with 27 percent who strongly approved. Rasmussen said those numbers are the worst ever for Mr. Obama. The 14-point gap between the two numbers is more than double the six-point difference in the Rasmussen poll as recently as Thursday. The total of "disapproval" responses, of whatever strength, topped the approval numbers by 51 percent to 48 percent. Using unusually strong language to describe the developments, borne out in a host of polls over the past week, political analyst Charlie Cook said in an e-mail to his subscribers that "the situation this summer has slipped completely out of control for President Obama and congressional Democrats... We believe it would be a mistake to underestimate the impact that this mood will have on members of Congress of both parties when they return to Washington in September, if it persists through the end of the congressional recess." did barack obama pal around with the cia? 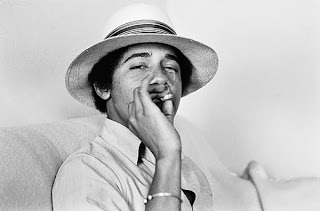 from isteve: My favorite conspiracy theory for the last few months has been that the young Barack Obama benefited from some CIA favors along the way, perhaps in transferring to Columbia U. or in his getting his copyeditor job at Business International, a firm with, apparently, ties to both CIA and SDS. Here's a website called Cannonfire that pulls together, in a disorganized fashion, various bits of evidence. There's nothing conclusive, but the young Obama probably had many more indirect links with CIA before the age of 25 than you did. jon voight: is obama creating a civil war in america? from washington times: A Hollywood conservative has headed East. It's "Freedom Concert" time for Jon Voight. The Academy Award winner will join Sean Hannity in Cincinnati and Atlanta this weekend to honor fallen soldiers and present college scholarships to surviving children. Mr. Voight - a warrior himself in many ways - has been cogitating about the state of America, meanwhile. "There's a real question at stake now. Is President Obama creating a civil war in our own country?" Mr. Voight tells Inside the Beltway. "We are witnessing a slow, steady takeover of our true freedoms. We are becoming a socialist nation, and whoever can't see this is probably hoping it isn't true. If we permit Mr. Obama to take over all our industries, if we permit him to raise our taxes to support unconstitutional causes, then we will be in default. This great America will become a paralyzed nation." false flag at dem headquarters in colorado? from kurt nimmo: It turns out the man accused of smashing windows at the Dem headquarters in Denver is a former Democrat. Earlier in the week a Democratic Party chairwoman said the vandals were people opposed to Obamacare. “An act of vandalism at Colorado Democratic headquarters that shattered windows next to signs about health care reform took a strange turn Wednesday when it was revealed that one of the suspects was a Democratic activist,” the Associated Press reported. “Democratic leaders initially said that the window shattering was an act of political vandalism, possibly by opponents of health care reform. But the political leanings of suspect Maurice Schwenkler raised the prospect that one of the party’s own might have vandalized its building to make a statement.” On Thursday, the crime took a turn for the weird. “In what a Republican lawmaker has touted as a bid to win sympathy for Democrats, an anarchist transperson allegedly shattered windows at the Democratic headquarters in Denver, Colorado,” Edge Boston writes today. It is said the accused vandal, Maurice Schwenkler, a.k.a. 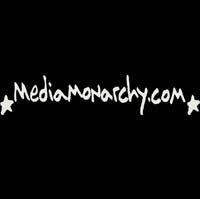 Ariel Attack, is a writer connected to “Queers Against Obama,” a fact established by Colorado Indymedia. from examiner: A Fraser fir from West Virginia will be the Christmas tree displayed inside the White House this year. Tree farmers Eric and Gloria Sundback were selected this month as grand champions of the National Christmas Tree contest. It's a record fourth win for the Sundbacks. Their trees were displayed at the White House twice during President Ronald Reagan's administration and once under President Jimmy Carter. The Sundbacks have grown Christmas trees since 1956, including the past 50 years in Shepherdstown, about 80 miles northwest of Washington. 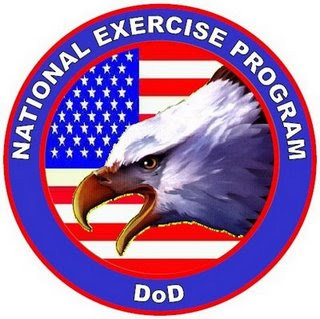 from defenselink: The North American Aerospace Defense Command and its geographical component, the Continental U.S. NORAD Region, will conduct training flight exercises on Thursday, Aug. 27 in the National Capital Region (NCR), Washington, DC. Exercise Falcon Virgo 09-11 will occur between midnight and 2 a.m. EDT. 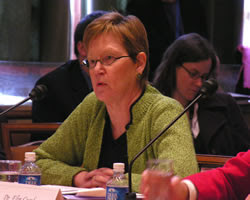 The exercise comprises of a series of training flights held in coordination with the Federal Aviation Administration, the National Capital Region Command Center, the Joint Air Defense Operations Center, the Continental U.S. NORAD Region (CONR), Civil Air Patrol, U.S. Coast Guard and CONR's Eastern Air Defense Sector. Exercise Falcon Virgo is designed to hone NORAD's intercept and identification operations, as well as procedural tests of the NCR Visual Warning System. The exercise includes two Civil Air Patrol Cessna aircraft and one Coast Guard HH-65 Dolphin helicopter. Residents may see these aircraft approaching and flying in the vicinity of the Washington, D.C., area as part of this exercise during the late night and early morning hours and continuing through the scheduled exercise hours. In the event of inclement weather, the exercise will push to the next day. For more information on the Exercise Falcon Virgo, please contact CONR Public Affairs at (850) 283-8080, or the NORAD Public Affairs Office at (719) 554-6889.
from corbett report: In an interview released today by Digg and the Wall Street Journal, Treasury Secretary Timothy Geithner was pressured about the growing popular movement to Audit the Fed spearheaded by Texas Congressman Ron Paul. A visibly uncomfortable Geithner attempts to dismiss the question by stating "I'm sure people understand that you want to keep politics out of monetary policy." When Geithner is again pressed on the issue, he makes the stunning assertion that conducting an audit of the Federal Reserve—something never before done in its 96 year history—is a "line that we don't want to cross," proclaiming that such a move would be "problematic for the country." Geithner's response that auditing the Fed would give politicians dangerous control over American monetary policy is mistaken at best and a deliberate lie at worst. Allowing the public to know what happened to their $24 trillion in bailout money does not give undue control of monetary policy to the people's elected representatives. Instead, such an audit would finally allow the public to see how their money has been spent in the midst of the largest spending binge in the history of the world's economy, hardly an unreasonable demand given the well-documented revolving door between the Treasury and Goldman Sachs, the main recipient of bailout funds. Ultimately, the Treasury Secretary is left spewing the absurdity that "I think even the sponsor of that bill recognizes how important it is to us to have the Fed independent of politics," which can only be said to be true insofar as Ron Paul—the sponsor of House Resolution (HR) 1207— wants to abolish the Federal Reserve system altogether. from vigilant citizen: 9/11 has inspired a myriad of memorials who are scattered all across America. Some of them are of questionable taste, others contain strange occult symbolism while others simply piss people off. 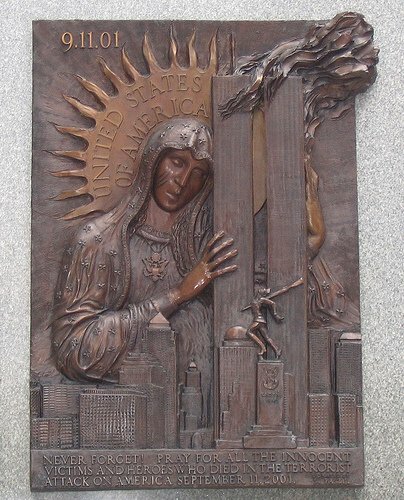 Here’s the five most offensive... #5 Boston Memorial, #4 Polish Plaque, #3 All-Seeing Eye Memorial, #2 Teardrop Memorial & #1 Crescent of Embrace... 9/11 was a terrible tragedy, no matter who made it happen **cough** Rumsfeld **cough cough ** False flag terror ** cough**. Sorry, I don’t usually cough while typing. Since this event was the most terrible terrorist act committed on US soil, it is simply fitting that many memorials appear in honor of those who unjustly lost their lives. Some of them are very touching, inspiring and heartfelt. Others, not so much. Some even make you wonder if they were actually built for the victims or to serve an agenda. The monuments here are controversial, insensitive and slightly offensive…a little like this article. Enjoy. 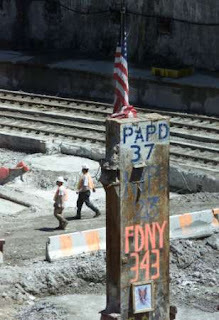 from dpa: A massive steel column from the original World Trade Centre destroyed by terrorist attacks on September 11, 2001, was returned to its original site on Monday to be a part of the memorial monument for victims. The 58-ton, 12-metre-high beam plunged deep into 'Ground Zero,' the site of the World Trade Centre's twins towers that collapsed, was the most visible remnant of the attacks. 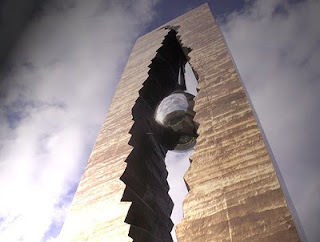 It stood erect while debris from the towers smouldered around it for weeks after the attacks. Its return also marked the rebirth of the World Trade Centre. The column was brought back from a depot at John F Kennedy airport to be the centre piece of the planned National September 11 Memorial and Museum. News reports said other large artefacts from 'Ground Zero' will also be returned to the site as construction for the new World Trade Centre is progressing. Joseph Daniels, president of the September 11 Memorial Foundation, was quoted as saying that artefacts like the steel column have "tremendous emblematic meaning... The last column represents all the effort by individuals that made this recovery effort unprecedented in American history," Daniels said. The United States will mark the eight anniversary of the attacks next month in which more than 3,000 people died. from ap: Lawyers for a Guantanamo Bay detainee will be allowed to question — in writing — accused Sept. 11 mastermind Khalid Sheikh Mohammed, a federal judge has ruled. The decision is a setback for government lawyers who had sought to limit the scope of detainee lawyers' challenges to the detention and prosecution of terror suspects. 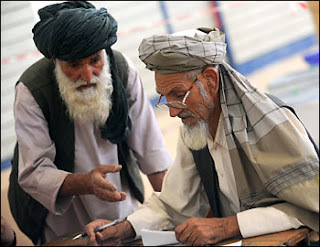 In a written ruling, Judge Ricardo Urbina says lawyers for detainee Abdul Raheem Ghulam Rabbani can submit written questions about their client to Mohammed. Prosecutors say he worked for Mohammed, but Rabbani's lawyers contend he was just a menial servant, not a part of any terror network. The ruling says prosecutors may review the answers before delivering them to Rabbani's lawyers to remove any national security information. from miami herald: A military judge says defense lawyers for an alleged Sept. 11 plotter held at Guantánamo don't need to inspect secret CIA overseas prisons to determine whether the accused al Qaeda terrorist is competent to stand trial. Judge Stephen Henley, an Army colonel, ruled Monday that the so-called black sites have likely changed enough since 2006 that an inspection would be of no use to Ramzi Bin al Shibh's Pentagon-appointed defense lawyers. from infowars: 'Invisible Empire: A New World Order Defined' sets out to do just that, define the term “New World Order” and shed light on the power elite, their agenda, and there modes of operation. Filmmaker Jason Bermas who is best known for his work on Loose Change, and more recently Fabled Enemies has decided to go beyond 9/11 and take the next logical step. Bermas takes a look at the history of power hungry madmen who seem to stop at nothing to shape the world in their vision, the scandals that surround them, the havoc they have reaked on the general populace, and what they have planned for the future of humanity. This is a no holds barred look into the real power structure that the mainstream media refuses to discuss and is a part of. After RFK's death, Edward was expected to waste little time in vying for the presidency. But in '69, a young woman drowned after a car Kennedy was driving plunged off a bridge on the Massachusetts resort island of Chappaquiddick after a night of partying. Kennedy's image was tarnished after it emerged he had failed to report the accident to authorities. He pleaded guilty to leaving the scene & received a suspended sentence. Kennedy eventually ran for his party's presidential nomination in '80 but lost to then-President Jimmy Carter. 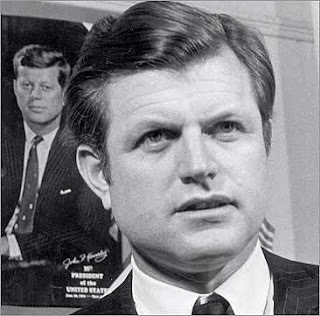 His presidential ambitions thwarted, Kennedy devoted himself to his Senate career. from paul joseph watson: Alex Jones’ highly anticipated upcoming documentary Fall of the Republic: The Presidency of Barack Obama boldly lifts the lid and unveils the fraud behind Brand Obama and how the globalists are using their newest, and slickest ever puppet to destroy the last vestiges of America’s freedom, Constitution and economy, all while helping the bankers loot the country clean. The film exposes the agenda that Obama was put in place to accomplish, a world government allied with a bank of the world run by globalist eugenicists hell-bent on destroying America’s first world status and replacing it with a hollow shell of tyranny. The mind control, the television programming, and all the media talking points that serve to reinforce the image of Brand Obama are laid bare, unveiling the naked ruth, as legendary author and documentary film maker John Pilger recently discussed, that Obama is nothing more than a corporate marketing creation, a skilled hypnotist using seductive tools of propaganda – race, gender and class – to hoodwink the masses into accepting his rhetoric while ignoring the contradiction of his actions. Personalities who will appear in the movie include Gerald Celente, Alan Watt, Jesse Ventura, climatologist Tim Ball, economist John Perkins, the Oath Keepers, Dr. Sherry Tenpenny, Webster Tarpley, Bob Bowman, Wayne Madsen and George Humphrey. 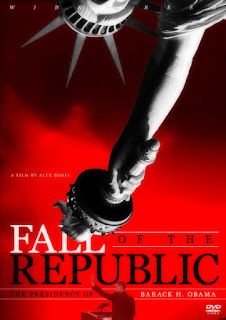 Fall of the Republic is an unprecedented two hour romp through the highly concentrated and brazen levels of tyranny and corruption displayed by Obama and his administration in the short period since they took office. 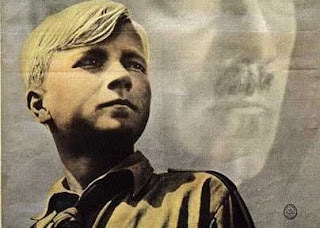 The end of the movie is encapsulated by the idea that the fight to maintain and restore a free Republic is a constant struggle against those who harbor the virus of evil in their souls. this is more 'change' we can't believe in. 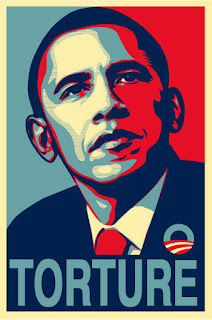 from ap: President Barack Obama has approved creation of a new, special terrorism-era interrogation unit to be supervised by the White House, a top aide said Monday, further distancing his administration from President George W. Bush's detainee policies. The administration has also decided that all U.S. interrogators will follow the rules for detainees laid out by the Army Field Manual, according to senior administration officials who spoke on condition of anonymity because they were not authorized to discuss the decision. That decision aims to end years of fierce debate over how rough U.S. personnel can get with terror suspects in custody. 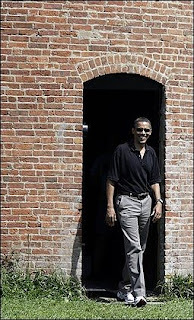 The new unit does not mean the CIA is now out of the interrogation business, deputy White House press secretary Bill Burton told reporters covering the vacationing Obama at Oak Bluffs, Mass. Burton said the unit will include "all these different elements under one group," and it said that it will be situated at the FBI headquarters in Washington. from thinkprogress: During a discussion on the future of newspapers & journalism on the Chris Matthews Show today , Time’s Joe Klein said that “on complicated stories, you can do this stuff on the internet.” Matthews responded by asking “who’s going to fact check?” As CNN’s Gloria Bolger began to answer that online editors would, Matthews interjected, “the bloggers don’t fact check.” “Nobody fact checks” online, added Klein... It’s ironic that a cable news host such as Chris Matthews would attack bloggers for supposedly not checking their facts, considering the amount of falsehoods & factually inaccurate statements he regularly utters on the air — which have all been fact-checked by bloggers.